David Lehman is internationally recognized as a poet, an anthologist, an editor, a literary critic and a New Yorker. He founded of The Best American Poetry series in 1988 and has been its editor ever since. He has also edited, among others, The Oxford Book of American Poetry (2006) and Great American Prose Poems: From Poe to the Present (2003). As a literary critic, he has published works ranging from The Last Avant-Garde: The Making of the New York School of Poets (1998) to A Fine Romance: Jewish Songwriters, American Songs (2009). As a poet, he has authored numerous collections of poetry that include Yeshiva Boys (2009), When a Woman Loves a Man (2005); and The Evening Sun (2002) and The Daily Mirror: A Journal in Poetry (1998). 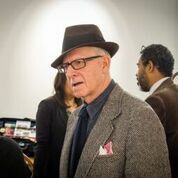 Lehman’s most recent publications include Sinatra's Century: One Hundred Notes on the Man and His World (2015); The State of the Art: A Chronicle of American Poetry, 1988-2014 (2015); and, New and Selected Poems (2013). He has written for Newsweek, People, The Washington Post, The New York Times, The Wall Street Journal, The American Scholar, and American Heritage. His poems have appeared in The New Yorker, The Atlantic, American Poetry Review, Poetry, The New Republic, The Paris Review and now Stay Thirsty Magazine. Lehman earned his Ph.D. from Columbia University and was a Kellet Fellow at the University of Cambridge. He has been awarded a Fellowship from the National Endowment for the Arts, the Guggenheim Foundation and the Ingram Merrill Foundation and he has received awards from the American Academy of Arts and Letters and the Lila Wallace-Reader’s Digest Writer’s Award. He is currently Associate Professor of Writing and Poetry Coordinator – Creative Writing Program at The New School in Manhattan. Stay Thirsty Magazine is honored to have been chosen by David Lehman to publish five of his original poems. Last night I walked among the gray-faced onanists and the women who love unrequited. sentences that daybreak will disperse. trombonist on his way to the cellar bar, the prisoner who knows he is guiltless. the nakedness of the night. I would sleep contented in the dreamless zone before dawn. and incredulity gives way to unconditional surrender. and young Isaac say it’s all right Ma I’m only bleeding. And Ma say it’s all right boy I’m only breathing. And Dad unpack his heart with words like a whore. Young Isaac ain’t gonna work for Maggie's brother no more. who wanna be on the side that’s winning. and has read all of F. Scott Fitzgerald’s books. He no get where he got because of his looks. and he knows something’s happening but he don’t know what it is. A strange man, Mr. Jones. Isaac Jones that is. in trout-besotted streams, meets the dawn. with deep passion for poetry and dance? I hear the question you left unasked. and walk with his maker and an unnamed third? observing instead of joining in the dance?